Stromatolites are trace fossils of the biofilms of blue-green algae that grow around an object such as a shell or oyster. As the algal filaments grow outwards, sediment is continually deposited and accreted onto the surface of the algal mat. The stromatolite increases in size and forms distinctive concentric rings if you break the stromatolite in cross section. 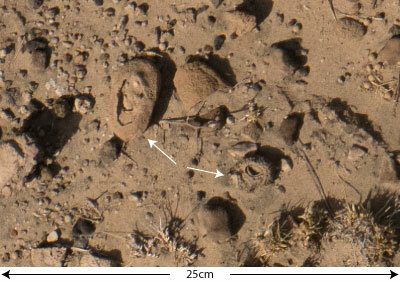 This is an earlier stage of stromatolite development that is growing around half of an inch long bivalve. The outer surface of the fossil stromatolites look quite knobbled in their appearance. 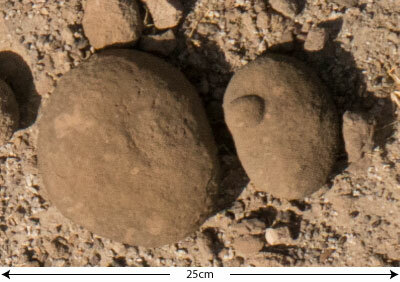 These round boulders can sometimes be quite large in the fossil record at Lake Turkana, sometimes reaching a meter wide. Some of these stromatolites can be up to a meter in diameter. This is a cross section of a stromatolite that has grown up around an oyster shell. Are they always just this look on the surface, or can they be other surface textures or colors?